Females and immatures are pale, yellowish brown with tho bold lines running along the length of the abdomen. The wings have a yellow costa and a very dark brown or black pterostigma. The males develop a blue pruinescence on the abdomen darkening to the rear with with S8-10 becoming black. Its eyes are very dark green. They fly swift and low, skimming the water surface. 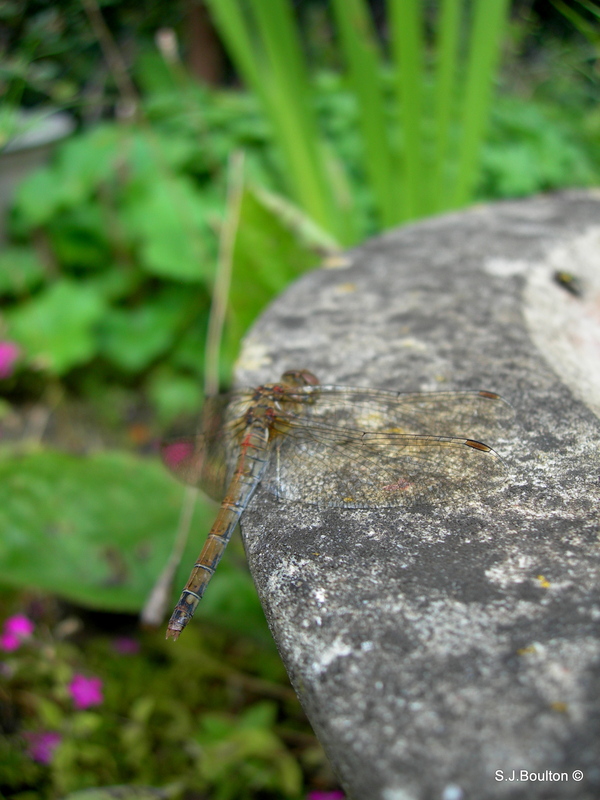 Yes I know its dead , As you know this blog is recording all the insects and other wildlife I get in my small Cambridgeshire garden. 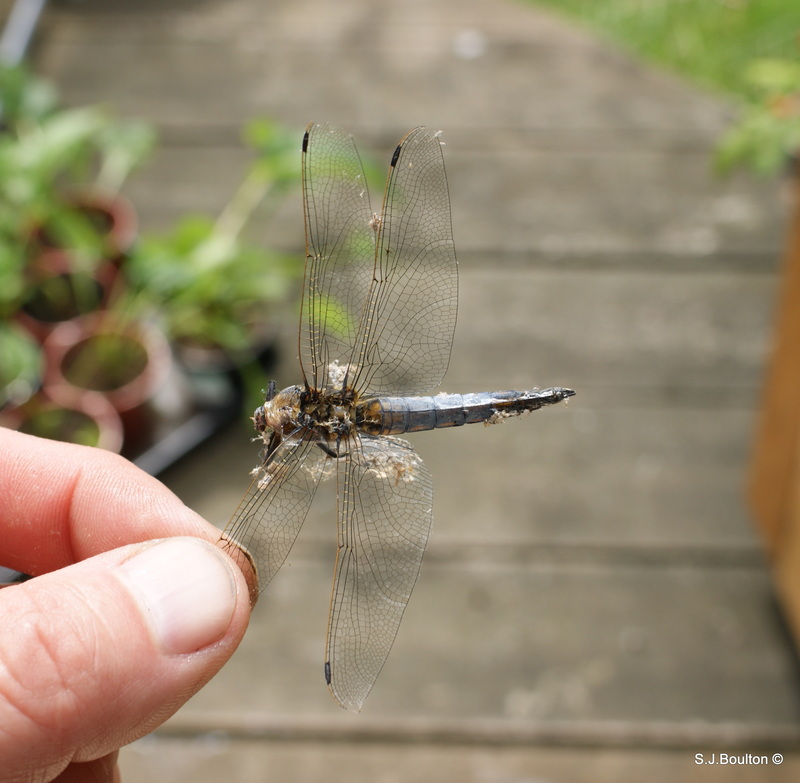 Well this was alive when it entered my garden and flew into my studio. It must have been when I was on holiday as I always check for butterflies etc that fly in. It gets very hot in there up to 40deg on a sunny day so it either died that way or by spider bite. The mature male Scarce Chaser possesses pale blue pruinescence on the abdomen. Its eyes are blue. However, prior to maturation the male and female look very similar and are highly distinctive with vivid orange colouration, black triangular shaped markings on the upper surface of each abdominal segment and dark bases to the wings. Synchronised emergence usually begins towards the end of May, and adults can be seen on the wing until early August. The Scarce Chaser is a species of Lowland river floodplains and usually inhabits slow-flowing, meandering rivers and large dykes. Occasionally mature gravel pits and nearby ponds also support populations. Inhabited sites characteristically have good water quality, which supports submerged and floating plants as well as prolific stands of emergent vegetation. 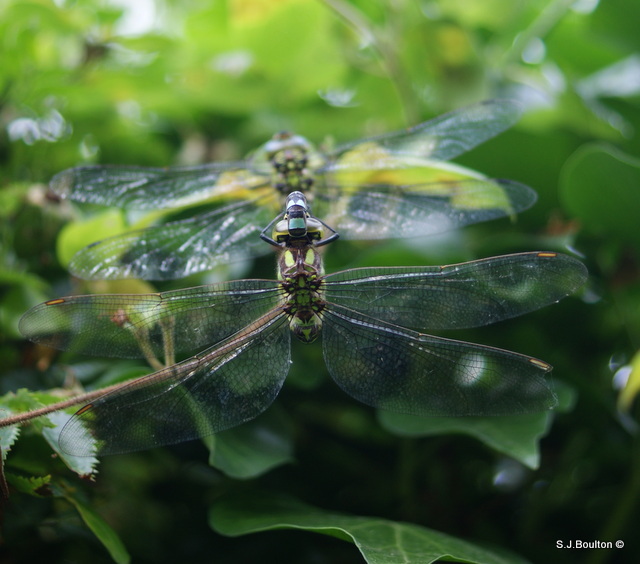 Ovipositing females require areas of slow flowing open water, and the adults require some shrub or tree shelter. L. fulva is scarce in Britain and is consequently listed under category 3 (scarce) in the British Red Data Book on Insects. The Scarce Chaser is restricted to 6 main localities in Norfolk/Suffolk, Sussex, Wiltshire/Somerset, Cambridgeshire, Kent and Dorset/Hampshire. Populations appear to be stable and there is evidence that suggests that it may be expanding its range. This landed on one of my hollyhocks , a beautiful looking thing. 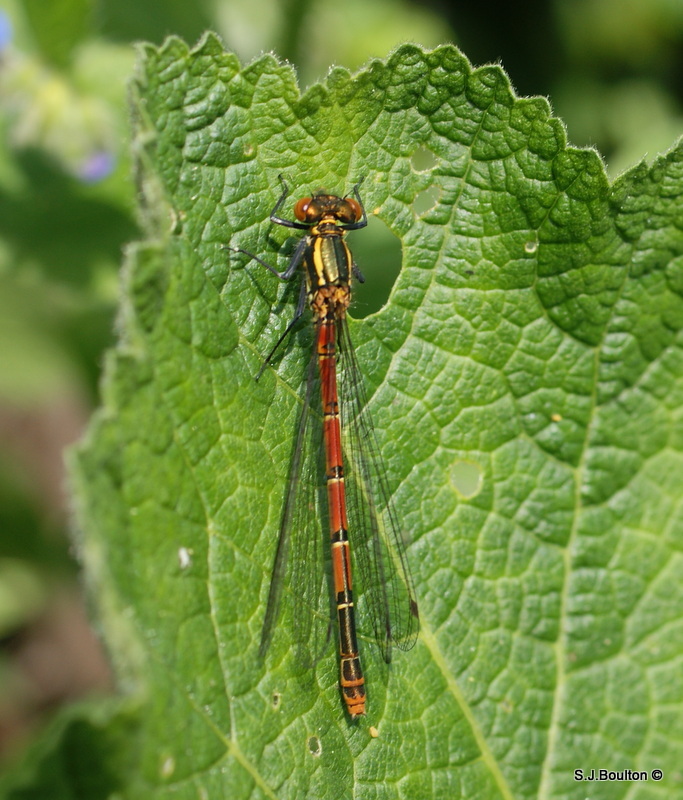 Often the earliest dragonfly or damselfly to appear, it is relatively easy to identify being red and black, with the black legs, which distinguish it from the Small Red Damselfly. 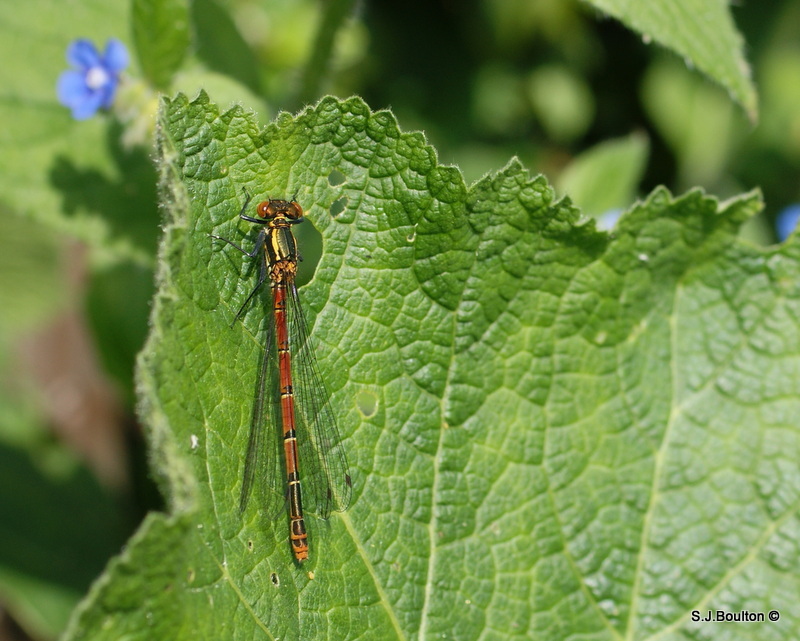 The Large Red Damselfly has a preference for well-vegetated sites, and is found on a variety of water bodies including ponds, lakes, rivers and canals. Mid April until the end of August. The Large Red normally has a two year life cycle. 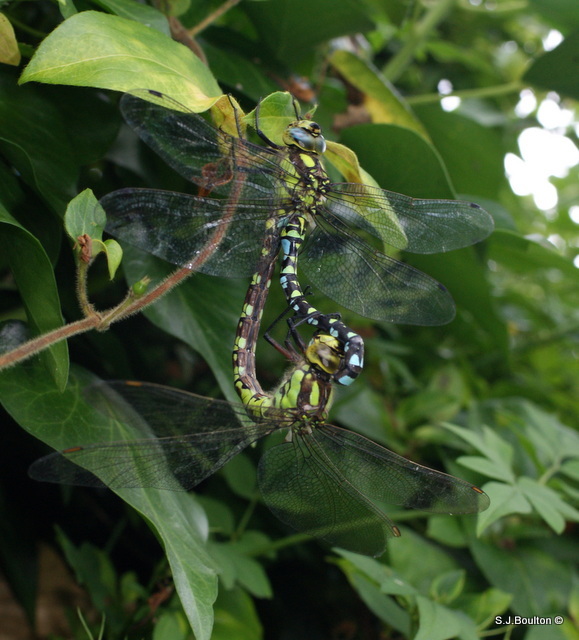 Unusually for dragonflies, the larvae are territorial as well as the adult males. Widespread throughout most of Britain. This large dragonfly is easily distinguished. Both sexes are a rich brown and have a distinctive golden-brown wings, which is often the most striking character of flying individuals. The male has two small blue spots on segment 2 and blue spots along the sides of the abdomen. Both sexes have yellow thorax stripes which are very bright yellow in males but duller in females. Breeding in a wide range of habitats ranging from still waters to slow flowing rivers, and frequently encountered in urban areas. Mainly found in central and southern England. 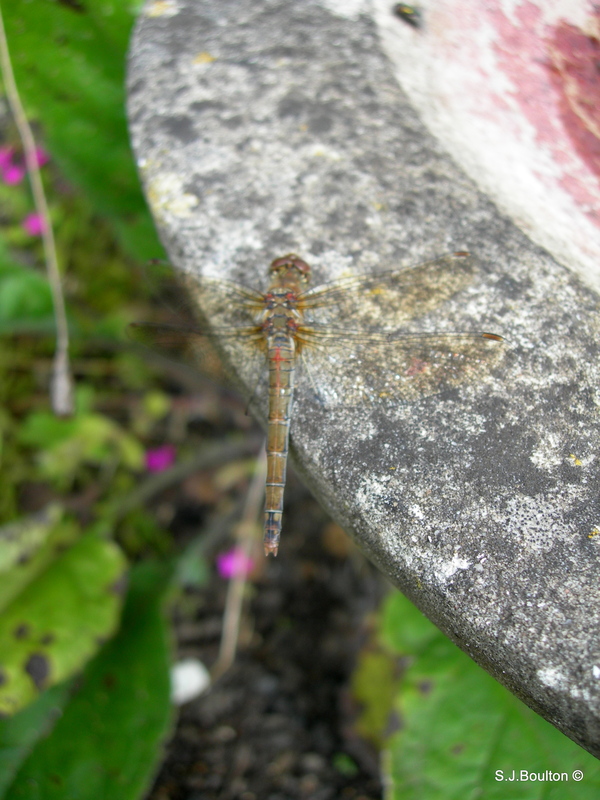 A small Hawker, not aggressive towards other individuals and occasionally seen in large feeding swarms. 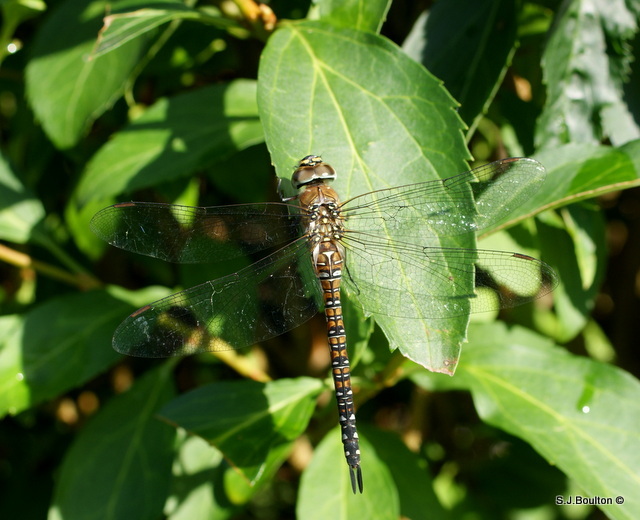 It flies late into the autumn and is likely to be the only Hawker found in November. The costa is brown and there is a “golf-tee” shaped, yellow mark on S2. The male looks quite dark with blue, paired spots along the abdomen. The pale yellow ante-humerals are indistinct and short and eyes are blue. The female is brown with similar markings to the male but the spots are smaller and often yellow, occasionally blue. The ante-humerals are insignificant or absent and eyes are brownish. 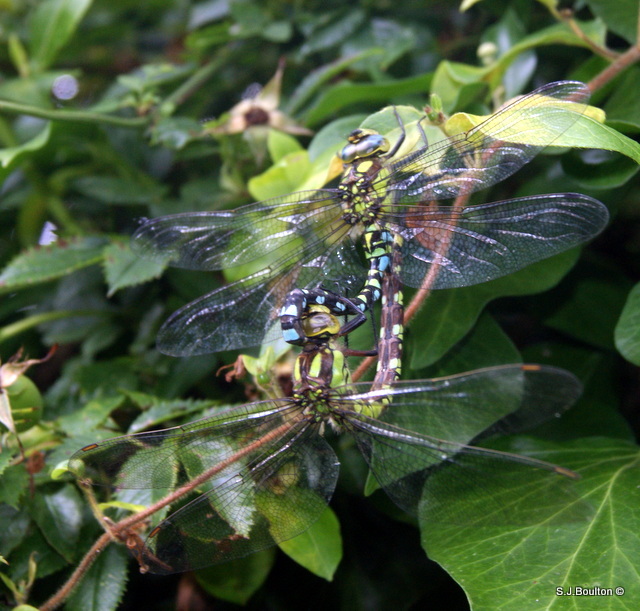 I saw these drop into my garden, Mating Southern hawkers. A large, inquisitive Hawker usually seen individually. It may fly quite close to investigate observers. The spots on segments S8-10 are joined, unlike other Hawkers. The ante-humeral stripes are broad and strongly coloured The costa is dark and there is an elongated triangular mark on S2. The male is brightly marked on a dark background, usually apple green except for S8-10, which are pale blue. Occasionally, all pale blue marked individuals are seen. The female is brown with bright green markings. Breeds in water line vegetation in well-vegetated, small ponds, often in garden ponds. Hunts well away from water and may be found hawking woodland rides well into the evening. Very common in southern and central England and Wales, more local elsewhere (vagrant only to Ireland). Today I cycled and walked a path I hadn’t been before and what a gem it was , peaceful, full of wildlife from bees to woodpeckers to a weasel. This walk takes you along the Lode , through fields and woodland a real good mix of habitats.